Featuring 26 pieces of original art from visual artists across North America and Internationally, the 2019 MFC marks the 33rd year of publication and features the theme of Coming Together: Exploring New Directions. The 2019 MFC looks for new paradigms on how to actively engage with each other that holds the promise of inclusion and not exclusion and strives to demonstrate visually and with content that there is less that separates us than brings us together. 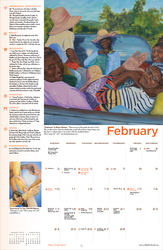 The new Calendar is dedicated to exploring this theme. Enjoy! This 36 page Calendar includes an introduction to the theme, 370 + accurate dates and meanings of significant religious and holy days plus many global cultural festivals, essays on the uses of calendars with lunar cycles and concise information about 14 religions present in North America. Religions included in the Multifaith Calendar are: Aboriginal Spirituality, Baha'i, Buddhism, Christianity, Hinduism, Islam, Jainism, Judaism, Scientology, Shinto, Sikhism, Unitarianism, Wicca and Zoroastrianism. 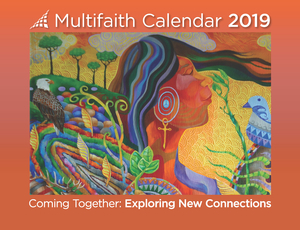 The Multifaith Calendar is a one-of-a-kind resource tool ideal for fundraising as well as being invaluable for faith leaders, educators, corporate managers, home family rituals and popular as a holiday gifts! It stimulates dialogue and discussion for interfaith gatherings and supports management in honoring special celebration days of fellow workers. The 2019 MFC measures 9.5" x 12.25" and makes a handy reference piece for the home or office. To see a sample page and the back cover collage of monthly images, click on the "view larger" icon below the main MFC image on this page.